You are here: Home / Blog / Forex Market Analysis / Review of 59 Trade Alerts for 2015: 36 Wins, 9 Losses, 10 Draws! Since the launch of our daily trade alerts for stocks, forex and indices in June this year (about 5+ months), we have had great feedback from out students on the amazing track record and transparency in posting accurate calls with entry price, stoploss, trailing stoploss (updated daily), multiple price targets, reward/risk ratio, and annotated charts with all these. 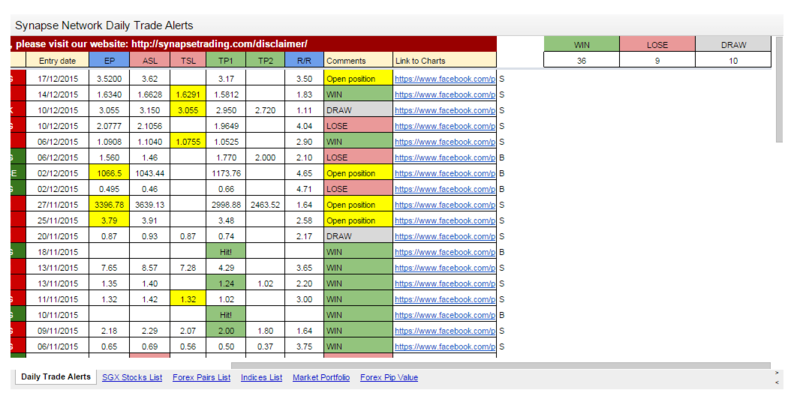 With just 15 minutes a day of trading, the results are 36 winning trades, 9 losing trades, and 10 trades that broke even. Currently, there are still 4 open positions. Considering that each winning trade can potentially make 2-5x of each losing trade, this is an extremely bountiful year for us. 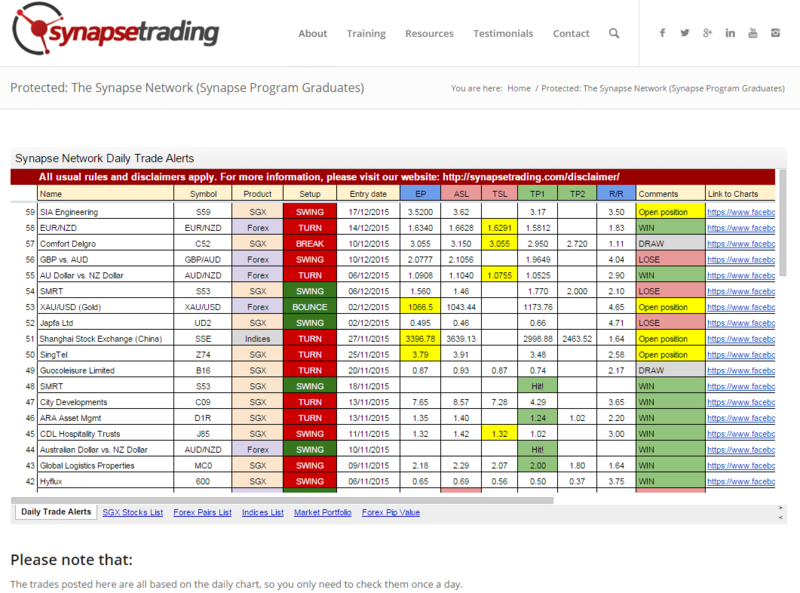 https://i2.wp.com/synapsetrading.com/wp-content/uploads/2015/12/daily-trade-alerts-181215.png?fit=1061%2C786 786 1061 Spencer Li http://synapsetrading.com/wp-content/uploads/2014/03/logo-header1.png Spencer Li2015-12-18 10:49:342018-10-30 12:38:24Review of 59 Trade Alerts for 2015: 36 Wins, 9 Losses, 10 Draws! Testimonials: “Material is Easy to Follow and Examples Are Relevant"